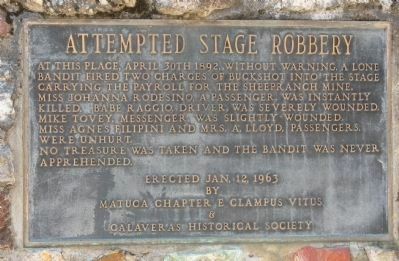 At this place, April 30th 1892, without warning, a lone bandit fired two charges of buckshot into the stage carrying the payroll for the Sheepranch Mine. Miss Johanna Rodesino, a passenger, was instantly killed. Babe Raggio, driver, was severely wounded. Mike Tovey, messenger, was slightly wounded. Miss Agnes Filipini and Mrs. A. Lloyd, passengers, were unhurt. No treasure was taken and the bandit was never apprehended. Erected 1963 by Matuca Chapter E Clampus Vitus & Calaveras Historical Society. Location. 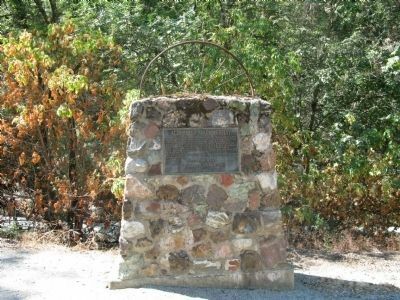 38° 11.366′ N, 120° 36.638′ W. Marker is near San Andreas, California, in Calaveras County. Marker is at the intersection of Mountain Ranch Road and Rocky Road, on the right when traveling east on Mountain Ranch Road. Touch for map. Marker is in this post office area: San Andreas CA 95249, United States of America. Touch for directions. (approx. 2.8 miles away); The Red Barn (approx. 3 miles away); First Restaurant in Town (approx. 3.8 miles away); San Andreas (approx. 3.8 miles away); Fourth Crossing (approx. 4.3 miles away); Chili Gulch (approx. 5.2 miles away). Touch for a list and map of all markers in San Andreas. I am her granddaughter. She was 15 at the time of the holdup and was 85 when she and her family attended the dedication of this marker in 1963. — Submitted September 23, 2008, by CM Smith of Concord, California. More. Search the internet for Attempted Stage Robbery. Credits. This page was last revised on October 1, 2018. This page originally submitted on August 12, 2008, by Syd Whittle of El Dorado Hills, California. This page has been viewed 2,089 times since then and 16 times this year. Last updated on September 22, 2008, by CM Smith of Concord, California. Photos: 1, 2. submitted on August 12, 2008, by Syd Whittle of El Dorado Hills, California. • J. J. Prats was the editor who published this page.